The nutritive and market value of meat of edible garden snail from northern Turkey was deter-mined. Protein, fat, ash, water and carbohydrate value of edible garden snail were found 9.87, 0.58, 1.07, 82.50 and 5.99 % wet weight, respectively. The results of this study have showed that garden snails are good sources of amino acid, fatty acid, vitamins and minerals. The ly-sine, isoleucine and leucine content from essential amino acids were 721, 467.57 and 611.50 mg/100g, respectively. The major amino acids detected were aspartic acid (996.814 mg/100g), glutamic acid (1405.158 mg/100g), alanine (1063.877 mg/100g), serine (1039.248 mg/100g). Total saturated fatty acid, monounsaturated fatty acid and polyunsaturated fatty acid were de-termined 28, 76, 20.66 and 34.38 %. The vitamin A, vitamin E, vitamin B1, B2, B3 and B6 of vitamins were 5.462, 0.887, 0.154, 0.065, 3.226 and 0.288 mg/100g wet wt, respectively. Min-eral analysis of garden snails showed that they are rich in calcium and potassium (1357 and 1054 mg/kg) and low in iron (5.21 mg/kg). Snails are members of Mollusca phylum, like slugs, oysters, squids and cuttlefish. They live widely spreader across fresh water, seas and land. Land based species prefer moist areas. They can be seen commonly through spring and autumn where rain fall is abundant (Thompson & Cheney, 2008; Robert, 2009). Human beings have eaten snails for thousands of years and nowadays snails are a common food consumed by millions of people worldwide (Jess & Marks, 1995). The market for snails and their products is of great interest in many countries of Europe and America because of their palatability. This mainly herbivorous species has high economic value and is considered to be luxury food. Snails are mainly consumed in France and Italy as well as in Spain, Germany and United Kingdom. For instance, in France, the annual requirement is about five million kilogrammes (kg) and over 60 percent of that is imported. The estimated annual consumption in Italy is 306 million snails. This is an indication that it has potential for export. Snail meat is a delicacy in Asian cuisines, Japa-nese and Chinese. In the United States and Aus-tralia it is consumed as main meal. In Africa, such as Nigeria and South Africa, land snail called giant African snail is also a traditional food (Lubell, 2003; Avagnina, 2006). Snails are handpicked by the collectors and traded as deep frozen or canned in garlic, butter/spice sauce. The most preferred and consumed species of snails is Helix aspersa (garden snail) which is found widely in west Europe and north Mediterranean (Bonnet et al. 1990; Lubell, 2003; Avagnina, 2006). Helix pomatia (Roman or edible snail) is another snail species which is consumed and can be found in mid and southeast Europe. Archatina fulica and Archachatina marginata are land based species which can commonly be found in Africa (Bonnet et al. 1990; Lubell, 2003; Avagnina, 2006; Thompson & Cheney 2008; Su-sanna, 2010). Snail is reared in commercial farms for its meat and shell. Helix aspersa, has been the principal subject of studies related to snail culture methods. Generally, mollusc meat is considered to be highly nutritious, owing to its content of essential amino acids, proteins, rich vitamins and minerals (Thanonkaew et al., 2006). Studies on the nutri-tional value of snail have reported that snail is high in protein quality but low in fat contents hence an alternative food for people with high protein quality low fat diet requirements. Alt-hough the nutritional composition of a variety of foods has been known for many years, relatively little information has been collected on the nutri-tional composition of edible snail. The aim of this study was to evaluate the nu-tritional properties of garden snails (Helix as-persa) handpicked along the Anatolia coast of Istanbul, Turkey. Knowledge of their nutritional properties would help individuate elements use-ful to their valorisation and promotion on the market. Three hundred garden snails (Helix aspersa) were collected by hand from the region Asian of Istanbul (Figure 1), Turkey. Collected snails were kept in 70-80°C water for 30 seconds. The meat was removed from the shell using hooks. After meat colour measurement, specimens were homogenized. Average weights of three hundred snails were 13.44 ± 1.12 g with shell and 12.59 ±1.32 g without shells. Moisture content was determined by drying an accurately weighed sample of minced samples in an oven at 105 ±2ºC for 3 h (Mattissek et al., 1992). The ash content was obtained by heating the residue for 3 hours at 550ºC (AOAC, 1998a). Fat was extracted according to the acid hydroly-sis method described by Weilmeier & Regenstein (2004). The total nitrogen content was deter-mined by the Kjeldahl method and was converted to crude protein content by multiplying by 6.25 (AOAC 1998b). Amino acid analysis was de-termined using high performance liquid chroma-tography (HPLC) (Shimadzu, Kyoto, Japan) (Er-kan et al., 2010). The IUPAC II D19 method (1980) was used to determine fatty acid compo-sition by Thermo Trace gas chromatography (GC) with auto sampler (Thermo, Milan, Italy) equipped with a flame ionization detector. Vita-min A and E were determined by AOAC (2005a & 2005b) method. Vitamin B1 and B2 were de-termined by acid hydrolysis method of Finglas & Faulks (1984), B3 and B6 content of samples were determined by the Ackurt et al. (1999) method. Determination of minerals was performed with a Thermo electron X7 inductively coupled plasma mass spectrometry (ICP-MS), model X series; Winsford-Cheshire UK (EPA, 1994). All chemi-cals used were of analytical grade. The colour of the garden snail samples was determined with the help of a Konica Minolta chromo meter (model CR 400/410; Minolta, Osaka, Japan). L* (brightness), a* (+ a, red; – a, green) and b* (+ b, yellow; – b, blue) values were measured. The colorimeter was calibrated using white references (CR-A44) (Gerdes & Santos Valdez, 1991). The proximate compositions of garden snails are represented in Table 1. 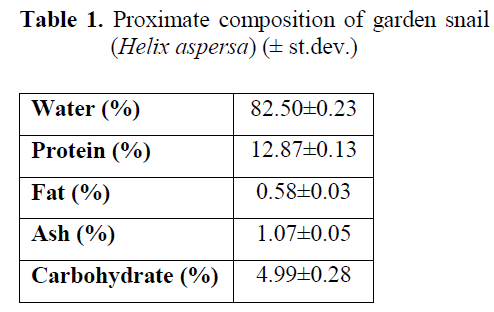 According to the re-sults of our study, garden snail consists of 80.50 ± 0.23 % water, 12.87 ± 0.13 % protein, 0.58 ± 0.03 % fat, 1.07 ± 0.05 % ash and 5.99 ± 0.28 % carbohydrate. Özoğul et al. (2005) reported these values for wild snail (Helix pomatia) from the south region of Turkey as 80.80% moisture, 16.35 % protein, 0.41 % fat and 1.89 % ash. In another study, for snail meat 10.22 % protein, 27.91 % fat and 2.57 % ash were reported (Ol-gunoğlu & Olgunoğlu 2009). Milinsk et al. (2006) reported that Helix aspersa maxima’s nu-tritional composition might change with its feeding habits (moisture, 77.47-79.85 %, protein, 9.50-12.56 %; fat, 0.45-2.66 % and ash, 0.65-0.92 %). Özden & Erkan (2011) reports 66.78 % moisture, 21.08 % protein, 1.96 % ash, 2.54 % fat and 8.64 % carbohydrate for sea snail. It has been noted in many studies that nutritional com-position may change between species. Factors like collection method and location, season and sexual condition are important factors for the nu-tritional compositions (Ludorff & Meyer, 1973). In the garden snail, a total of 21 fatty acid (FAs) were identified. Milinsk et al. (2006) and Özoğul et al. (2005) have discussed the fatty acid composition of garden snail and reported a total of 20 and 21 FAs, respectively. 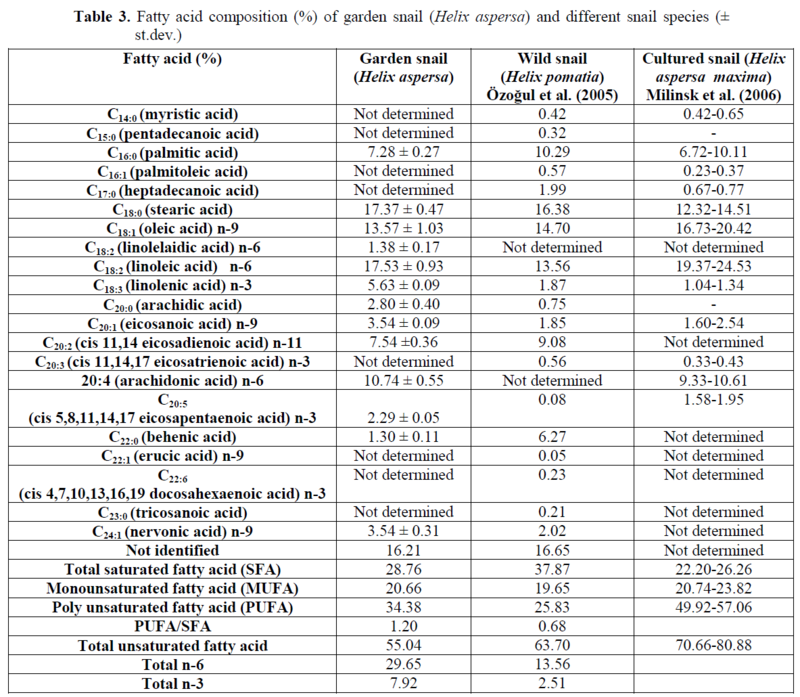 Previ-ous studies reported lower FA values for various snail species. In the present study, unsaturated fatty acid contents (UFAs) were found 55.02 % for garden snail, and these ratios were higher compared to those of saturated fatty acids (SFA). In the garden snail, stearic acid (18:0) was the main component of SFA followed by palmitic acid (16:0). Milinsk et al. (2006) reported that the content of SFA was 22.20 % and staeric acid (12.32 %) was also the primary SFAs followed by palmitic acid (6.72%). Although in the pre-sent study, profiles of the FA in garden snail were dominated by PUFAs and SFAs (Table 3), it has been shown that wild snail Helix pomatia muscles may contain much higher SFA (37.87%) and much lower PUFAs (25.83%) (Özoğul et al., 2005). Oleic acid (C18:1 n-9) has been reported as the dominant monounsaturated fatty acid (MUFA) in this species examined. In addition, our results indicated that polyunsaturated fatty acids (PUFAs) were the most abundant FA in the garden snail. PUFAs are separated as n-3 and n-6 FAs due to their well-studied and distinct epide-miological function in humans (Eseceli et al., 2006). Among the PUFAs, linoleic acid (n-6), arachidonic acid (n-6), linolenic acid (n-3) and eicosapentaenoic acid (n-3) were the dominant fatty acids in this study. The n-3: n-6 ratio has been suggested to be a useful indicator for comparing relative nutritional values of food oils. A higher ratio of n-3: n-6 PUFAs has often been cited as an in-dex of better nutritional value (Zhao et al., 2010). According to current WHO recommendations, daily ratio of n-3: n-6 in a balanced human diet should be lower than 1:5 (Vujkovic et al., 1999). Although the n-3: n-6 ratios of both snail species were within the recommended value, n-3: n-6 ra-tio of garden snail was higher compared to wild snail (Tables 3). These results indicate that snail species contain a balanced lipid composition for nutritional purposes. A, E, B1, B2, B3 and B6 vitamins have im-portant roles in human metabolism, immune sys-tem and digestive system. It is reported that the human body needs 1.5 mg vitamin A, 17 mg vit-amin E, 1.4 mg vitamin B1, 1.6 mg vitamin B2, 17 mg B3 and 1.9 mg vitamin B6, daily (Belitz et al., 2001). Our results indicate that 100 g snail meat contains 5.462 mg vitamin A, which is suf- ficient. It is also noteworthy that the same amount of snail meat would meet the required amounts of vitamins-, E, B1, B2, B3 and B6. Our study shows that garden snail Helix aspersa is no different from the other animal food sources in terms of vitamin content (Table 4). A, E, B1, B2, B3 and B6 vitamins have im-portant roles in human metabolism, immune sys-tem and digestive system. It is reported that the human body needs 1.5 mg vitamin A, 17 mg vit-amin E, 1.4 mg vitamin B1, 1.6 mg vitamin B2, 17 mg B3 and 1.9 mg vitamin B6, daily (Belitz et al., 2001). Our results indicate that 100 g snail meat contains 5.462 mg vitamin A, which is suf-ficient. It is also noteworthy that the same amount of snail meat would meet the required amounts of vitamins-, E, B1, B2, B3 and B6. Our study shows that garden snail Helix aspersa is no different from the other animal food sources in terms of vitamin content (Table 4). As rich in protein and amino acids, our study shows that garden snails are also rich in minerals (Table 5). Calcium was determined the highest in Helix aspersa land snails (Ca, 1357mg/kg), fol-lowed by potassium (K 1054 mg/kg), phosphorus (P 967 mg/kg) and sodium (Na 919 mg/kg). In addition 170 mg/kg magnesium (Mg) and 5.21 mg/kg iron (Fe) was measured. The mineral content is known to change by location, biologi-cal cycles, season and feeding habits (Özoğul et al., 2005). Especially, Helix aspersa is compara-ble with Atlantic bonito with regards to mineral content (Oksuz et al., 2008). Similar to other aquatic products, especially fish, snail meat has vitamin content. When physical parameter “colour” of the land snail is evaluated L* brightness value was calculated 54.67±1.85, a* redness value was -0.03±0.89 and b* value was 19.49±1.53 (Table 6). Comparable data were found in this regard. This study shows that, garden snail meat has similar levels of proteins, amino acids, vitamins, minerals and fatty acid contents as other seafood. It is an important food source to supply daily nu-tritional needs. Given improved culture tech-niques it has the potential to become an important culture species providing a rich source of pro-teins, vitamins and minerals. Turkey has the po-tential to economically benefit from this species. Snail culture is particularly important in the light of declining natural stocks with the rising de-mand on snail meat. Seasonal abnormalities and lack of rain is another stress factor on natural oc-curring snails. Culture techniques for snails must be developed to ensure a continuous and high quality snail meat production. This work was supported by Research Fund of the Istanbul University. Project number UDP 6205. Adeyeye, E.I., Afolabi, E.O., (2004). 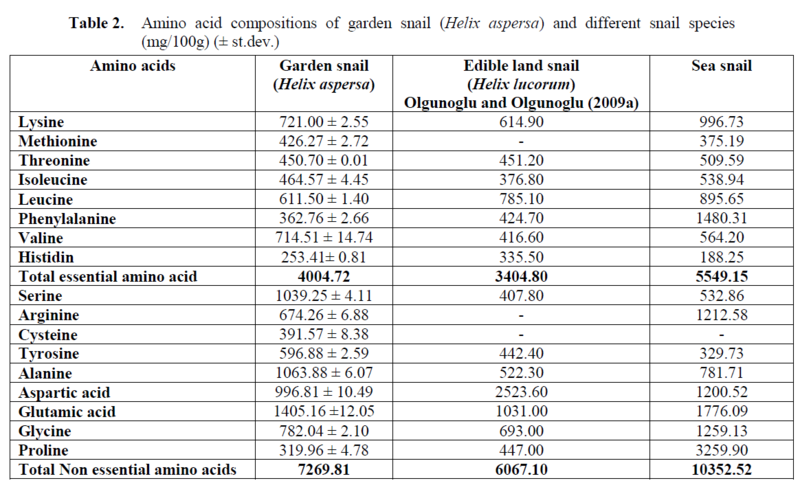 Amino acid composition of three different types of land snails consumed in Nigeria, Food Chemis-try, 85: 535-539.doi:10.1016/S0308-8146(03)00247-4 AOAC, (1998a). Official Method 938.08.Ash of Seafood.Chapter 35, p.6.Fish and Other Marine Products. James M. Hungerford. Chapter Editor. 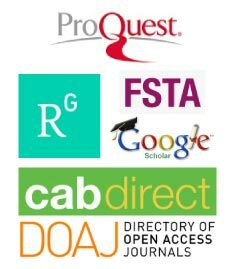 Official Methods of Analy-sis of AOAC International.Edited by PatricaCunniff. AOAC, (1998b).Official Method 955.04. Nitro-gen (Total) in Seafood. Chapter 35, p.6.Fish and Other Marine Products. James M. Hungerford. Chapter Editor. Official Meth-ods of Analysis of AOAC International.Ed-ited by PatricaCunniff. Belitz, H. D., Grosch, W., Schieberle, P., (2001).Lehrbuch der lebensmittelchemie. Berlin, Heidelberg, New York: Springer-Verlag. ISBN: 3-540-41096-15. Bonnet, J.C., Aupinel, P., Vrillon, J.L., (1990). L’escargot Helix aspersabiologie-élevage.Institut National De La RechercheAgrono-mique (INRA). ISBN 2-7380-0247-1.124 pages.Paris EPA, (1994). Microwave assisted acid digestion of sediments, sludges, soils, and oils. Method 3051.http://www.epa.gov/SW-846/pdfs/3051.pdf (visit date January 2007). FAO/WHO/UNU (2007). "Protein and amino acid requirements in human nutrition", WHO Press. http://whqlibdoc.who.int/trs/WHO_TRS_935_eng.pdf, page 150. Gerdes, D.L., Santos Valdez, C., (1991). Modi-fied atmosphere packaging of commercial Pacific red snapper (Sebastesentomelas, Se-bastes flavidus or Sebastesgodei), Lebens-mittelWissenschaft und Technologie, 24: 256-258. Mattissek, R., Schnepel, M.F., Steiner, G. (1992). Lebensmittelanalytik, Grundzüge, Metho-den, Anwendungen. ISBN: 3-540-54684-7 ZweitekorrigierteAuflage. Springer Berlin Heidelberg New York. Olgunoğlu, I.A., Olgunoğlu, M.P., (2008). Ye-nilebilir Kara Salyangozu (Helix lucorumLinneaus, 1758) Etinin Amino AsitKompozisyonu, Uludağ Üniversitesi Veter-iner Fakültesi Dergisi, 27(1-2): 35-39. Olgunoğlu, I.A., Olgunoğlu, M.P., (2009). Don-durulmuş Tereyağlı Salyangoz (Helix lu-corum Linnaeus, 1758) Etinin Hazırlanması ve Besin Etiketi Analizleri, Biyoloji Bilim-leri Araştırma Dergisi, 2(1): 39-43. Susanna, T., (2010).Gastronomic gastropods, New Agriculturist, http://www.new-ag.info/99-3/focuson/focuson3.html. 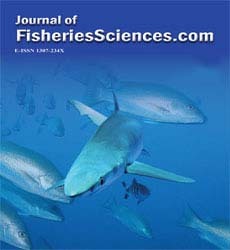 Vujkovic, G., Karlovic, D., Vujkovic, I., Voros-baranyi, I., Jovanovic, B., (1999).Composi-tion of muscle tissue lipids of silver carp and big head carp, Food Science and Technol-ogy, 76: 475-480.